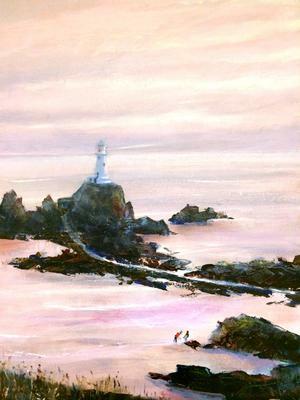 Corbiere Lighthouse, Jersey, Channel Islands. An interesting place in that the Islands are granite and have many jagged outlying rocks, combined with having one of the highest tidal ranges in the world (35+ ft), and of course a tidal stream that can reach 7 knots. At high tide the rocks around the lighthouse are invisible and I'm told that you can sail across the inner passage ... I just don't think I would chance it! The tide comes in so swiftly that beachcombers can easily become stranded! I can't help but feel that the acrylic colours I used to paint this are a little cool - I used Alizarin Crimson. Perhaps I should have used a warmer red - what do you think? This is stunning, the colour is so delicate and the atmosphere you have created is almost ethereal. Absolutely gorgeous painting. Love the glow and I wouldn't have changed the red, perfect as is. Love it the way it is. Gives me a good feeling when looking at it. I like the tones and colours just the way they are. A real mystical feel. Like it a lot.